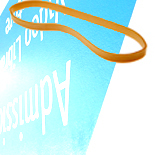 This article was written on 19 Jun 2012, and is filled under art engagement, experimental projects. Local gallery for emerging projects, Southern Exposure (SF) and one-time partner-in-crime, Machine Project (LA) are in the midst of a grand experiment. They have created 20 continuous days of events in 20 homes in San Francisco- pairing not only artists from each city, but also graphic designers to make the posters for each event at each home. Ours being one of them (this Sunday, register here*). 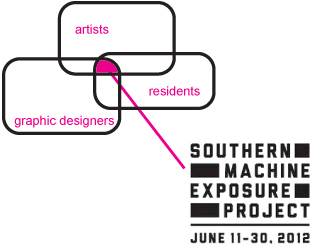 It’s called Southern Machine Exposure Project. I went to the “Closet Concerts” event, pictured above. It was held in an apartment in San Francisco, folks brought drinks and hung out, listening to a variety of concerts coming from several rooms (and closets) around the apartment. One artist was an opera singer who shoved an invitation to press your ear against the door while she sang to you (she was amazing) through various sound tubes on the other side. The others were louder, and reverberated throughout the space. It was a sybaritic sound event. I’ll always remember that house, the experience, the evening. I met friends there too. The art-making (and recording) was raw and exposed- as the artists eventually emerged from their various closest at the end. As a host to one of these events, I’ve had occasion to talk with the SOEX and MP folks. A comment I hear frequently is how cool it is for them to see inside all these homes. While it may not be practical for many to attend all 20 events, attending several will give you a sense of your city and contemporary art in a way a gallery visit could not create. This is an amazing, and complex undertaking- and working in the museum world, I naturally try to apply this to that model. Would a curator come to your home and pair your artwork with theirs? Would a museum be able to pull off this level of city-wide collaboration and engagement? What kinds of relationships would that make between a museum and the community it lives in? Pretty tough to literally apply, but it has parallels that are very much worth considering. I’ll follow-up about the event at our place- and SMEP will have great documentation. We’re looking forward to it and feel lucky. Colin Dickey discusses the history of the Temptation of St. Anthony, the story of the 4th century desert ascetic who was tortured by hordes of demons and would go on to become the patron saint of skin diseases. Anthony became a popular subject during the Renaissance, when painters such as Heironymous Bosch, Matias Grunewald and Pieter Bruegel the Elder depicted these torments in a series of ever more fantastical and grotesque animals, and in the 19th century it became a lifelong obsession for Gustave Flaubert, who spent decades trying to craft his own retelling of the saint’s life. Topics to be discussed include: epilepsy, ergotism, demonic possession, madness, the scourge of masturbation and its relationship to capitalism, and Flaubert’s very complicated feelings about images, photographic and otherwise. A ‘museum’ style audio tour of Mark and Maria’s house that will provide backstory on their lives, their home, including everything from the quotidian and mundane to the most intense and precious. People will access the tour via an itunes podcast. The project is inspired by Maria’s career as an exhibition designer and Mark’s avocation as a collector of various types of mechanical machines and objects. Lecture: The rich, slick-haired fatcats at Mercedes-Benz have long been supporting the idea that Karl Benz’ 1885 three-wheeler was the birth of the automobile. Most general-interest automobile books and coffee table car books echo this idea as well, leaving the truth a bit harder to find. This lecture is about blowing the lid off that old, common notion and exploring motoring’s rich and weird heritage prior to 1885. We’ll even help you decide what car to buy when you find yourself in the 1860s!